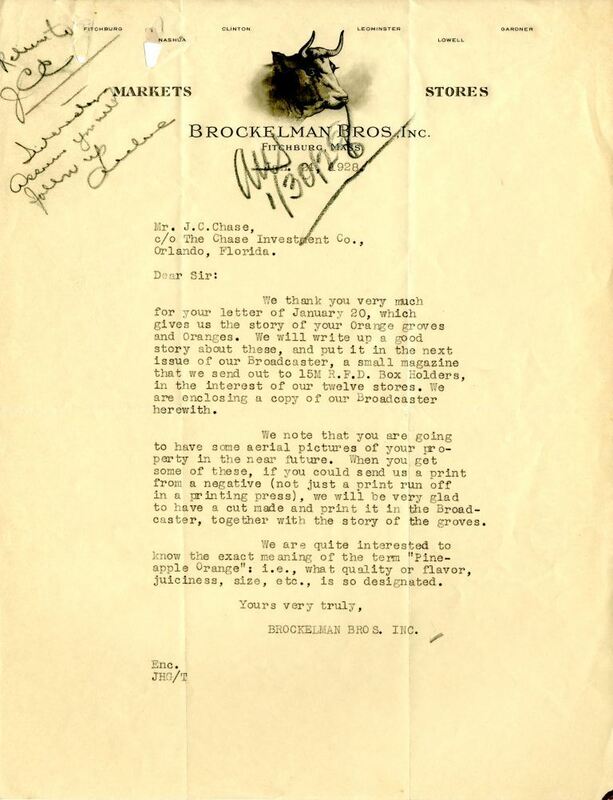 An original letter of correspondence between Joshua Coffin Chase and Brockelman Brothers, Inc. Topics discussed in the letter include the publication of the story of Chase & Company's orange groves at Isleworth Grove, aerial photographs of the Chase property, and the meaning of the term "pine-apple orange." According to the letter, the pineapple orange produces excellent quality juice, but is extremely susceptible to freezes, citrus blight, and preharvest fruit drop. 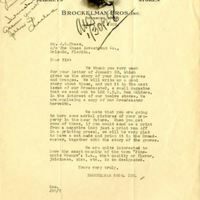 Original letter from Brockelman Brothers, Inc. to Joshua Coffin Chase, January 24, 1928: box 49, folder 20.84, Chase Collection (MS 14), Special and Area Studies Collections, George A. Smathers Libraries, University of Florida, Gainesville, Florida. We thank you very much for your letter of January 20, which gives us the story of your Orange groves and Oranges. We will write up a good story about these and put it in the next issue of our Broadcaster, a small magazine that we send out to 15M R.F.D. Box Holders, in the interest of our twelve stores. We are enclosing a copy of our Broadcaster herewith. We note that you are going to have some aerial pictures of your property in the near future. When you get some of these, if you could send us a print from a negative (not just a print run off in a printing press), we will be very glad to have a cut made and print it in the Broadcaster, together with the story of the groves. We are quite interested to know the exact meaning of the term “Pineapple Orange”: i.e., what quality or flavor, juiciness, size, etc., is so designated. 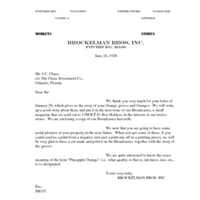 Brockelman Brothers, Inc.. “Letter from Brockelman Brothers, Inc. to Joshua Coffin Chase (January 24, 1928).” RICHES of Central Florida accessed April 21, 2019, https://richesmi.cah.ucf.edu/omeka/items/show/2696.